5 star Hotel Melia Varadero is set in one of the most beautiful areas of Varadero and is receiving guests from all parts of the world since 1991. Melia Varadero is extremely attractive for any incentive trip because of it facilities for business meetings, banquets and is ideal for weddings and honeymoons. Personal wedding ceremony coordinator will tailor-made your special day especially for you so to guarantee you unforgettable memories. 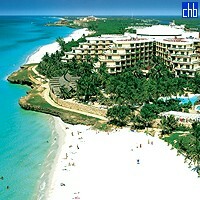 Also Melia Varadero hotel has it is own golf course and therefore recommended for golfers. Just the moment you walk in into the Melia Varadero you will be impressed with a lobby, roofed with a majestic dome and decorated with plants and flowers, sort of a charming forest, as a permanent tribute to Nature. 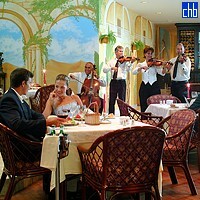 The hotel is a five-story building surrounded with beautiful tropical gardens. Wide and comfortable rooms and suites are overlooking the beach, the sea and golf course. 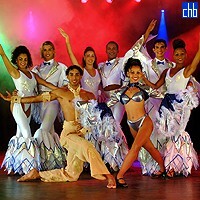 The facilities of All Inclusive Melia Varadero hotel include 3 large swimming pools with swim up bars, golf course, great variety of restaurants and bars, spas, all kinds of water sports, horse back riding, Spanish and salsa classes, plenty of day and night entertainment, excursions. Double Standard rooms exquisitely decorated. Rooms are overlooking the golf course or beatiful tropical gardens. In addition to standard facilities you will have a coffee maker, plug for electric shaver in the bathroom and comfortable furnishings in the terrace / balcony. 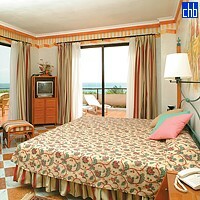 Rooms are very similar to the standard rooms but have a magnificent view of the ocean.